I heard about a week ago that the ol' GH had a one-off brew on offer - an English bitter with a go-to name of "Gahan Best Bitter". 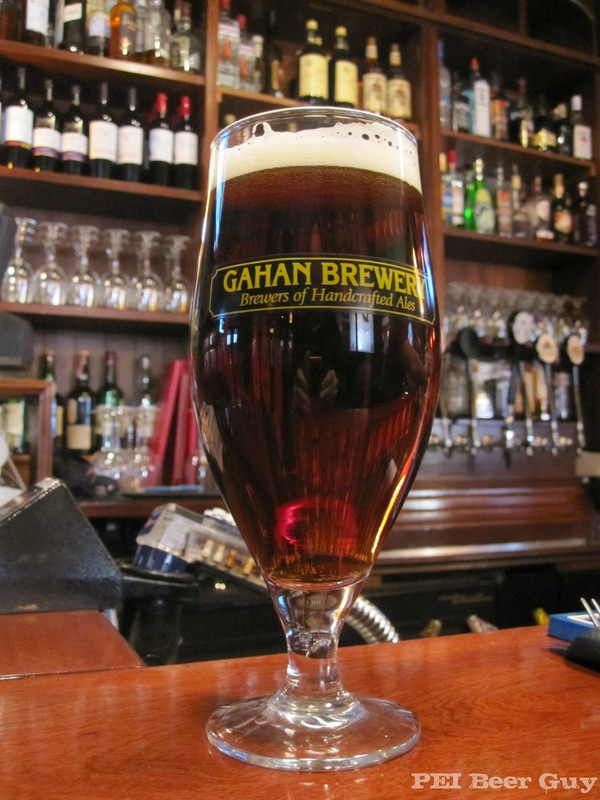 Brewed back in early December, it is a sessionable English Ale, weighing in at about 4.3% abv. The hops used were East Kent Goldings, and the malt profile consists of English malt and the tiniest bit of Black Patent malt (500 grams out of 168 kg). I'm doing this review mostly from memory (sampled on Tuesday), so forgive anything unclear / not quite right. The appearance of the finished product, as you can see, is a very clear, ruby-brown (my new invented colour of the day) with a creamy white head. The aroma is mainly of toffee and a bit of caramel. The taste is also of toffee and caramel. Something honestly reminds me of the pints jugs of draft I used to drink at The Barn - not a good thing, you'd think - but it was actually something about it that I liked. I think it was a bit of the sweetness, and mostly the feel. But I digress. I think there's something also slightly earthy & woody about it - probably from the E. K. Goldings hops. As a nice surpise, the burps were rather hoppy - more like I'd been drinking an APA or IPA. A nice twist. The body was fairly medium despite the low alcohol content, and had a fairly sticky finish. The carbonation was light, didn't build if held in the mouth, and left no impression after a swallow. There was a fairly lingering lingering mild bitterness, mild sweetness & a sticky to dry feel. Overall, this was a very enjoyable brew. I could easily see it becoming a regular or regular seasonal. Nice job, Bryan! As a side note, the "Best Better" was originally a typo. I liked the ring of it, though, so I decided to leave it alone. 0.3% of Black Patent (if I did my math correctly)... that IS low. But a little BP goes a long way. Nice they tried such a simple malt bill... English Bitters can taste so "cluttered" when people start throwing in a bunch of malts. Wish I could have tried it! With any luck, maybe it'll return (there may still be some left). It's a good beer, and I know the brewer of it's a fan!